All transactions are safe and secure with a reliable history in online purchasing behind each of our associates. Buy the Scarface Portrait t-shirt to own Scarface clothing and merchandise. Recall some of the most memorable Tony Montana scenes from the movie in this piece of bestselling movie clothing. Relive these classic moments in cinema history with this black Scarface tee that features a portrait of Tony on the front. 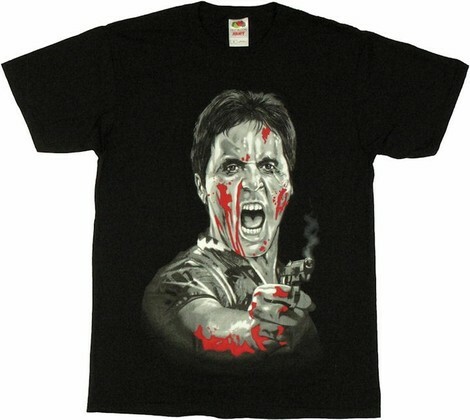 The black, white and red portrait on the front of this Scarface t-shirt features Tony covered in blood with his smoking gun handy. This piece of movie apparel will have you exclaiming, "Say hello to my lil' friend." In addition to the Scarface Portrait tee above, browse the Scarface Clothing Gallery for more apparel like men's and women's clothes, kids shirts or hoodies.